Lauren London pays a heartfelt tribute to Nipsey Hussle. 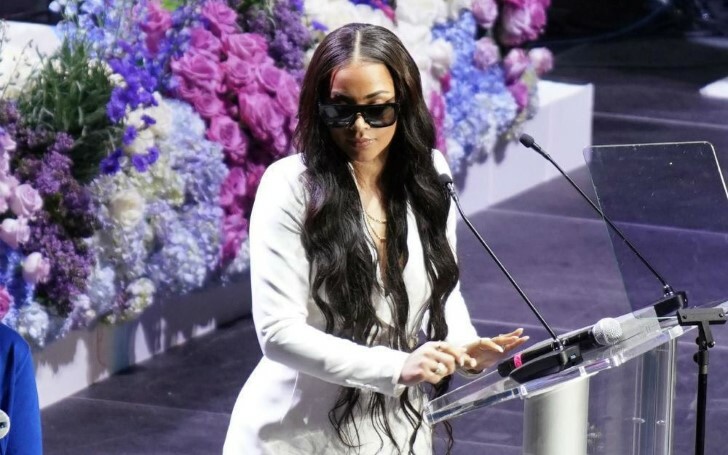 The 34-year-old star, Lauren London paid a touching tribute to her late partner, Nipsey Hussle at his memorial service in Los Angeles on Thursday. The rapper was shot and killed last month at the age of 33. Lauren spoke of the "pain" that their two-year-old son Kross will never really remember his father. Referring to the rapper by his real name, the actress said: "Ermias I want you to know that I feel real joy in my heart when I'm around you... I'm totally myself when I'm with you." "My pain is for my two-year-old who probably won't remember how much his dad loved him... Ermias said you can't possess people, you can only experience them. "And I'm so grateful I got to experience such a man. His soul was majestic. He was the strongest man that I ever knew. A gentle father, a patient leader, a divine light." The 'ATL' actress thanked Nipsey for his encouragement and support helping her become "more of a woman". She also admitted he will always be the love of her life. Lauren continued: "He would listen to audiobooks at night and I would tease him... but I thought that was the coolest s**t ever. "You've made me into more of a woman. You have encouraged me and inspired me to reach higher. 'You've been the greatest boyfriend to me. You and I work. We fit. And you're the coolest guy in the world to me still. The service took place at the Staples Center where Lauren's nine-year-old son Cameron - whose father is Lil Wayne - took to the stage. The little boy recalled Nipsey appearing in his dream two days after his death. There were thousands of guests at the memorial, most notably Jay-Z and Beyonce. Likewise, Stevie Wonder, Snoop Dogg, NBA stars Russell Westbrook and James Harden, YG, Hussle's brother and his mother all paid tribute at the service. In addition, written tributes were also read out from Barack Obama and Kendrick Lamar. Following the conclusion of the memorial, the guests joined in a 25-mile long procession to a funeral home where the singer will be laid to rest. A private funeral service was held on Wednesday, a day prior to the public one.